Maybe you look at Valentine’s Day as a wonderful excuse to dedicate an entire day to the celebration of love between you and the people you care about; or, maybe you take a more cynical approach and view it as just another way The Man can turn the wheels of the capitalist machine. Sure, I think we’d all agree that Valentine’s Day isn’t the only day we can make the extra effort to show appreciation for our loved one’s ; however, if you remove the forced pressure and manufactured aspects of the whole thing, I can most definitely get on board with intentionally setting aside a specific day to reflect on my relationships, think about where I can make improvements improve and grow those relationships, and express to my loved one’s the ways in which they’re important to me. I think this is something we all can do regularly throughout the year to foster more loving and meaningful relationships, including on Valentine’s Day. Valentine’s Day doesn’t have to be about romantic love, by the way. Nor does it have to be about gift giving. But, at the same time, there are those who reserve it as an opportunity to buy gifts as a token of their love. There are many among us who love giving gifts more than receiving them. According to a National Retail Federation survey projecting sales for Valentine’s Day in 2018, it was anticipated that consumers would spend $19.6 billion US dollars, with jewelry accounting for $4.7 billion of the total. The survey also projected that consumers would spend, on average, $143 US dollars, which was up from the average of $136 in 2017. I’m not sure what the projections for this coming Valentine’s Day will look like, but if they’re anything like last year, lots of people will be buying jewelry. Heading to the mall and buying something from the case of a nameless jewelry shop, or off the jewelry tower at one of the cheap-o box stores might seem like the easiest and most cost effective option, but you don’t have to break the bank to buy a piece of jewelry that has been crafted with as much love and intention as you want to convey in gifting it. 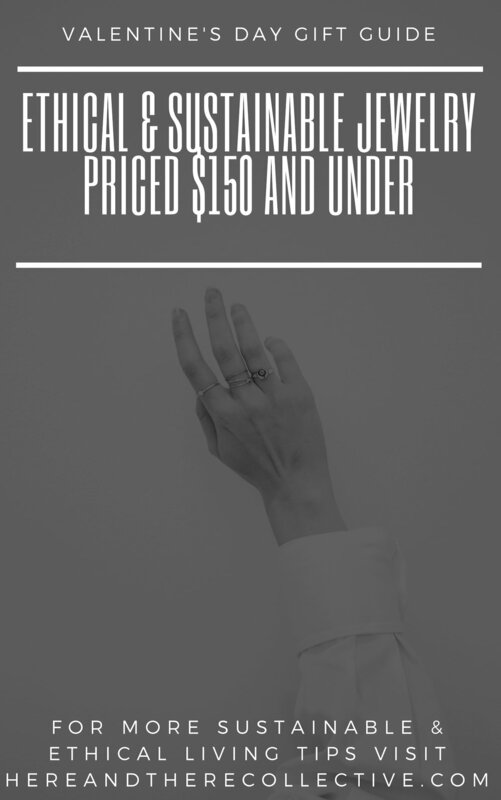 So, I’ve curated a selection of 6 pieces of jewelry, all lovingly handmade with care, ethics, and sustainability in mind, all priced at $150 and under. 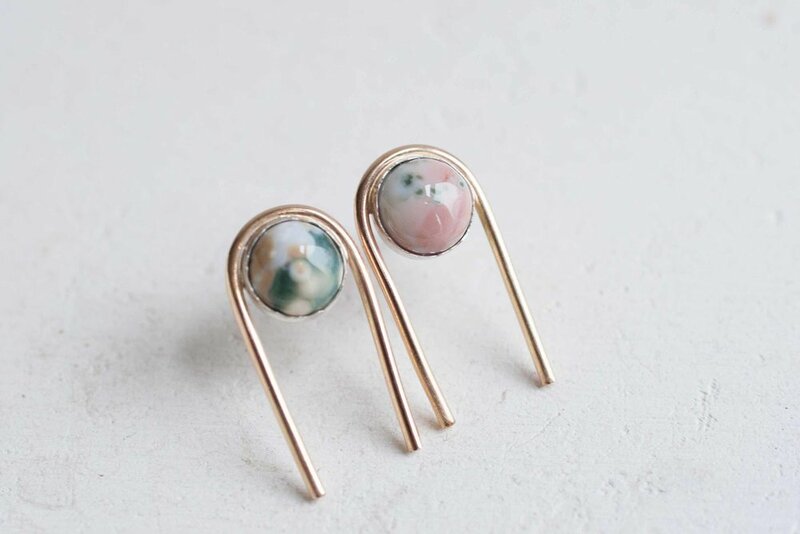 Handcrafted in Australia by jewelry designer Elizabeth H , each piece is made using recycled or ethically sourced metals in a renewable energy powered studio. Even though every effort is made to minimize their environmental impact, Argent calculates their carbon footprint and offsets it by financing rewilding and reforestation programs. Read more about their sustainability and ethics here. Made from recycled 9 carat solid gold, the double arch ring is hand sawn, filed, and shaped - so each and every piece is unique. 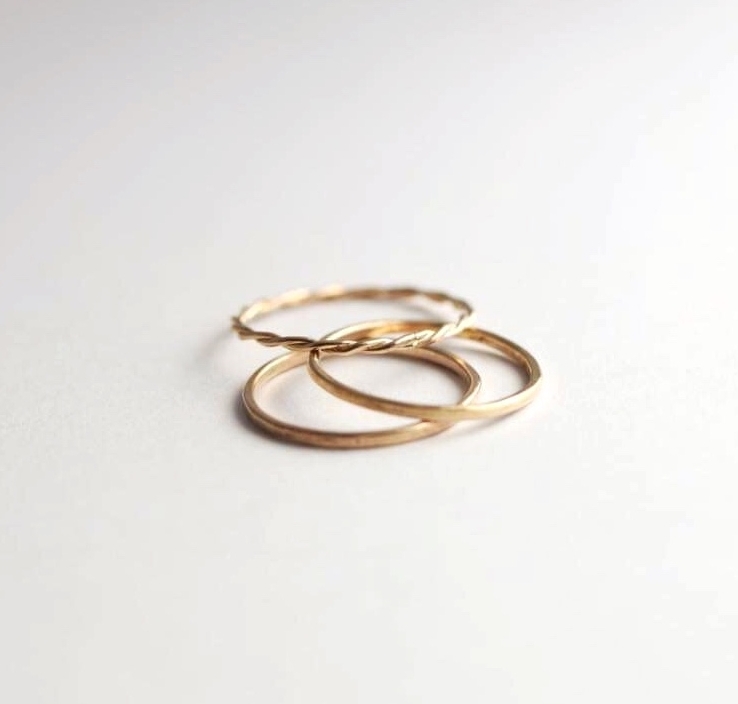 Simple, elegant stacking rings help one look effortlessly polished and put together. 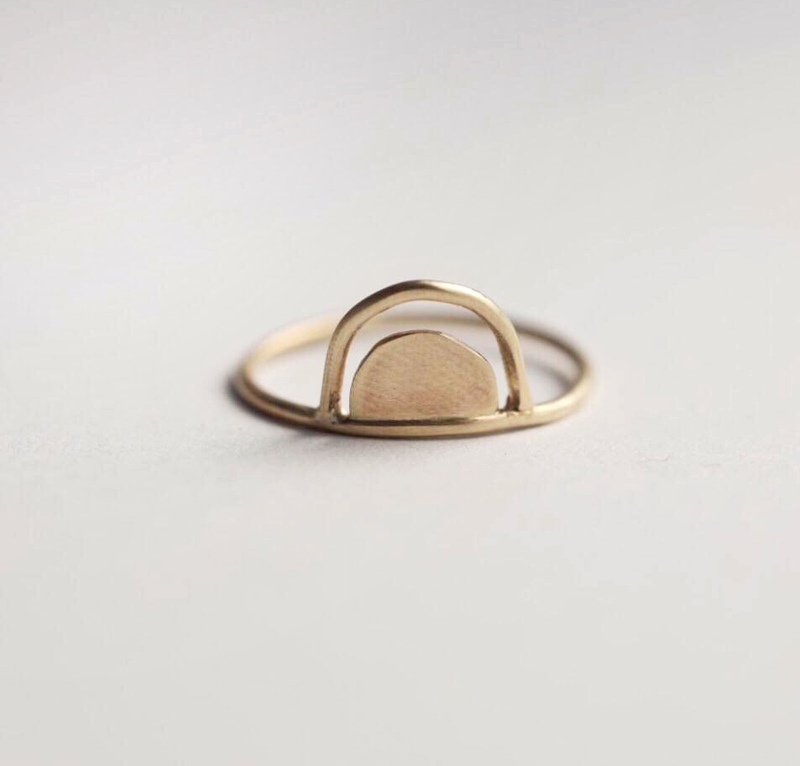 Made from recycled 9 carat solid gold, the stacking ring works well on its own, or stacked! I think it looks lovely stacked with the twisted wire ring. 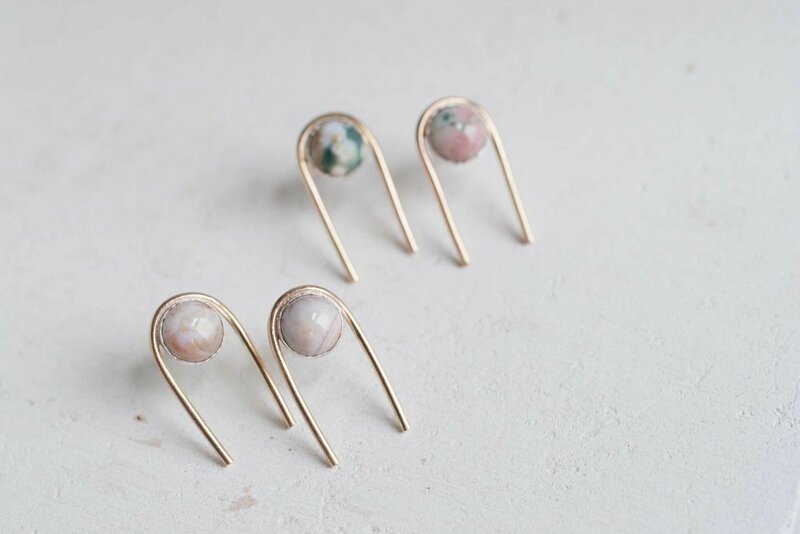 Bario Neal is a design forward, women-owned, feminist company who is leading the charge in ethical sourcing and manufacturing within the jewelry industry. 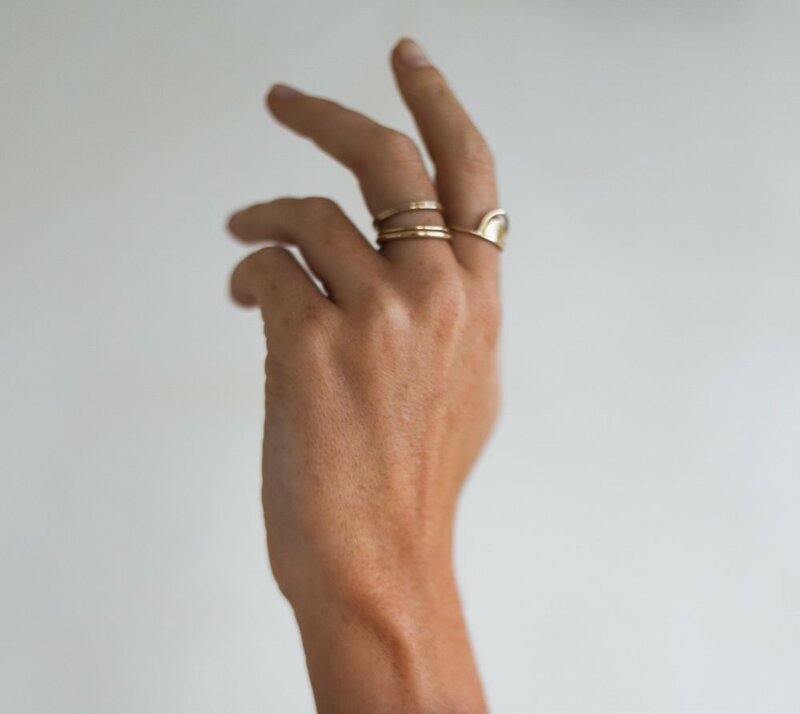 With showrooms in Philadelphia and New York City, Bario Neal creates a range of jewelry including exquisite pieces perfect for weddings and engagements, to more simple and affordable pieces for every day wear. Read about their ethics and sustainability here. 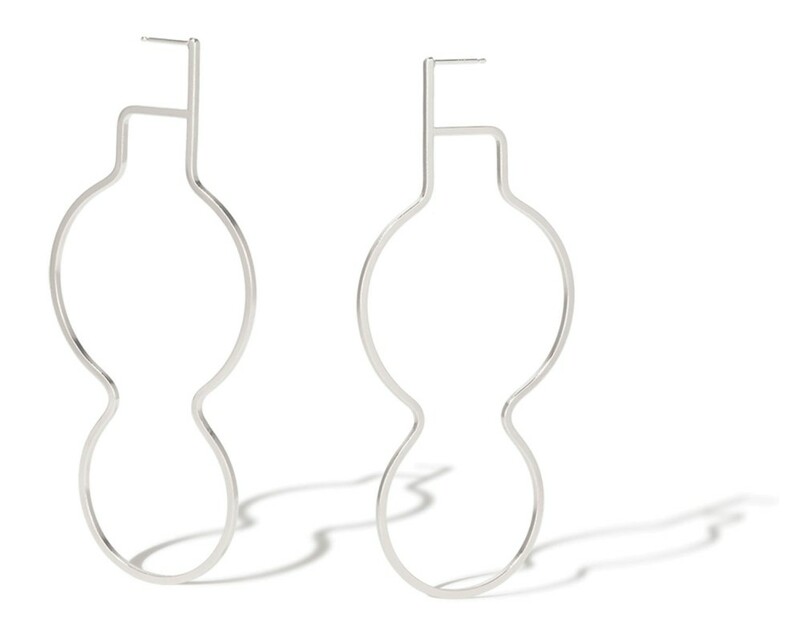 These striking and architectural earrings are sculpted from reclaimed sterling silver. 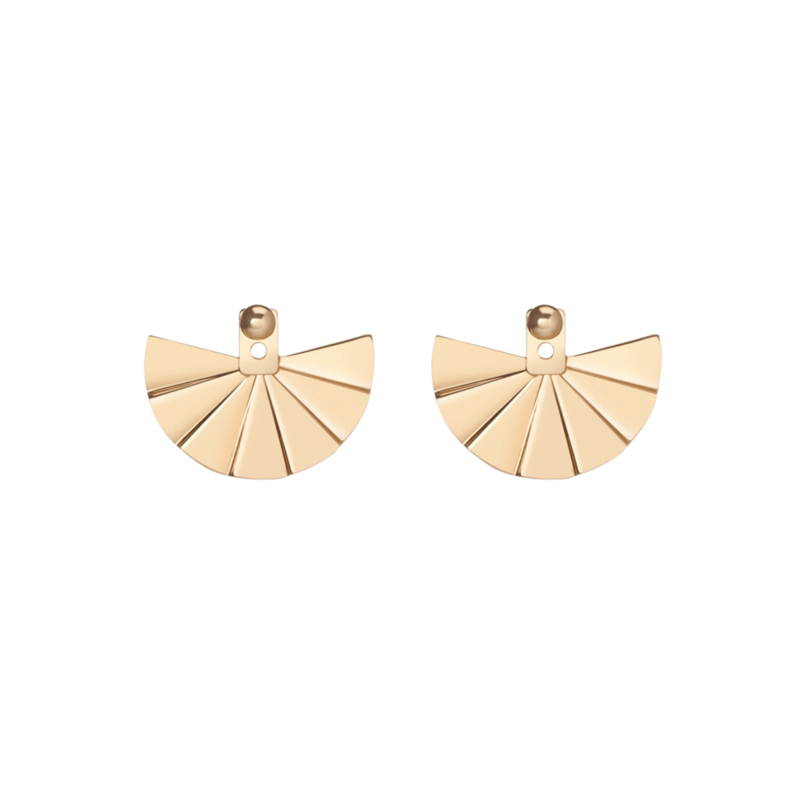 If you’ve got more money to spend, this pair is also available in reclaimed 14 carat yellow gold. Bario Neal uses reclaimed metals processed by refiners in the United States who are committed to minimizing their environmental impacts. Handmade in New York, Aurate is meticulous about the sourcing of their materials, sourcing only from high quality, ethical and conflict free suppliers. They’ve also built their business model upon transparent pricing, and believe that extraneous costs and markups should not be passed along to the consumer. Finally, one of the driving principles behind Aurate is their mission to give back, which they do by supporting literacy programs in New York. For every purchase, Aurate donates a book to a child in need. This jewelry company sources recycled precious metals that have been refined and milled into sheet and wire and sells only conflict free diamonds. They also operate on a give-back model, in which a portion of their profits are donated to humanitarian organizations, and a horse rescue farm. Read more about the specific organizations here. Furthermore, Mineralogy plants one tree for each item sold through One Tree Planted. Found only in one specific region of Madagascar, the patterns and unique bands of colors on each piece of Ocean Jasper varies - customers can indicate a preference, or Mineralogy can choose. 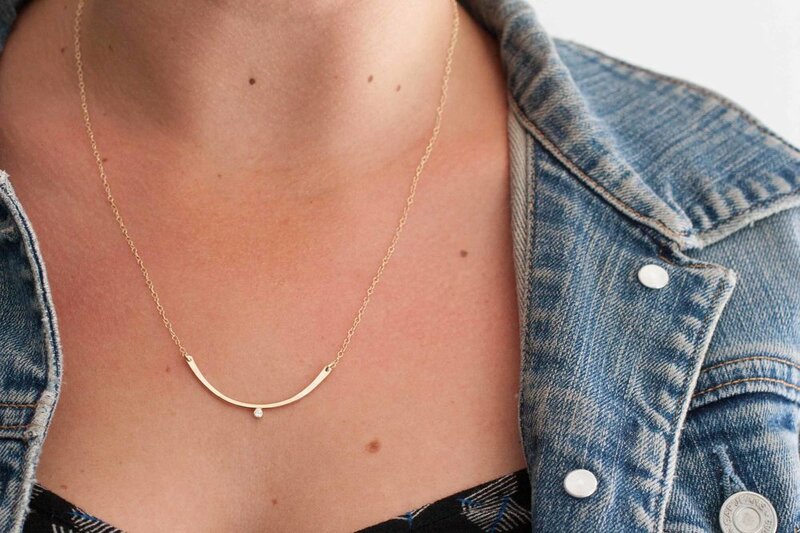 The arc is made from 14K gold fill and backed with sterling silver posts. 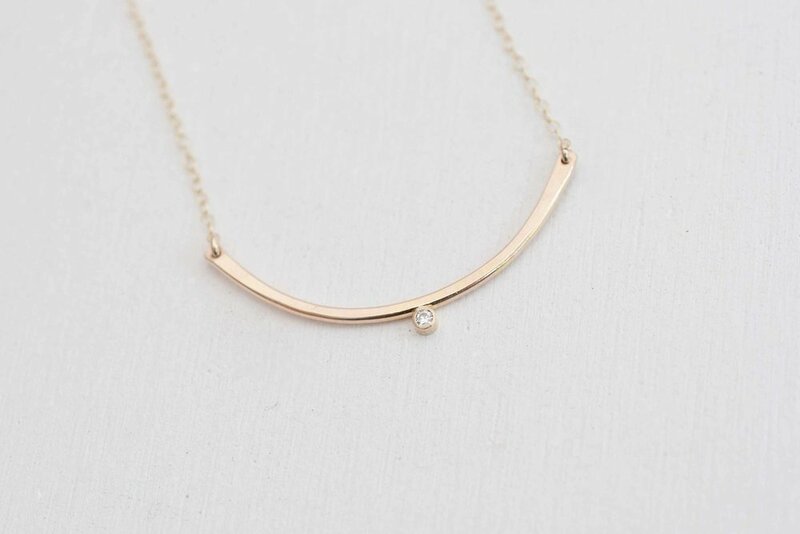 This necklace is handmade from 14K gold fill - the arc is delicately accented with a moissanite gem. Moissanite are bright stones that are often referred to as “space diamonds,” because microscopic particles of the gem were originally discovered in 1893 in a meteorite crater. Considered an ethical alternative to diamonds, moissanite are incredibly brilliant, durable, and resistant to high heat.